The Weirdest Moon in the Solar System - is there a giant walnut orbiting Saturn? In candidates for the weirdest moon in the solar system, Saturn's moon, Iapetus, can easily take the title. 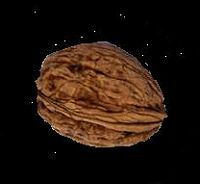 For a start, it looks like a giant walnut. This enigmatic moon displays some remarkable characteristics that simply can't be explained. For a start, its poles seem squashed inward, while its equator is pushed out, causing a marked elliptical shape, helping towards creating the "walnut" image. Secondly, half of it is light in colour, while the other half is dark. Why this is is unknown. Thirdly, there is a prominent mountain range all the way round its equator, with an accuracy of a few degrees. This cannot be explained either. 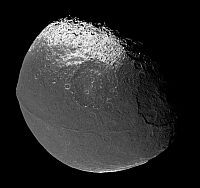 Also, out of Saturn's four major moons, Iapetus displays an orbit well out of the equatorial plane, unlike the other three, plus it is a lot further out from its host planet. This is also a puzzle. It is now thought that the dark side is made of some sort of charcoal, while the light side is ice. In the above images, the one on the left is not in shadow. That's its actual colour. As has been said already, the reason for this contrast is not known. This moon has a prominent mountain range running all the way through the dark region along its equator. The mountains within it can be over 12 miles high. Although several hypotheses have been put forward to explain why a huge mountain range should hug the equator in this way, none have come close to being conclusive. 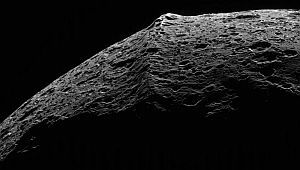 Although American author and conspiracy theorist, Richard C. Hoagland, maintained that Iapetus was actually an artificially created object, perhaps the most famous explanation of Iapetus's strange features comes from renowned science fiction author, Arthur C. Clarke. In the book version of 2001: A Space Odyssey, the hero, astronaut David Bowman, reaches Saturn and finds what appears to be a "star gate" on Iapetus (Clarke uses the spelling "Japetus" throughout). He explains that the creation of this star gate caused a moon to be destroyed, creating Saturn's rings and, in the dead centre of Iapetus's white region, there is one of the famous black monoliths. It's as good an explanation as any. The weirdest moon in the solar system might actually be a gateway to other dimensions. Wouldn't it be good if it were true?